← What is an ectopic pregnancy? Expectant management where no treatment is given and we wait for the ectopic pregnancy to fail and resolve without intervention. We check this by tracking the level of human chorionic gonadotrophin (hCG) and hopefully watching it decline over time. Medical management with a drug called methotrexate and subsequent follow up with blood tests to measure the change in hCG as a marker of response to treatment. Surgery. 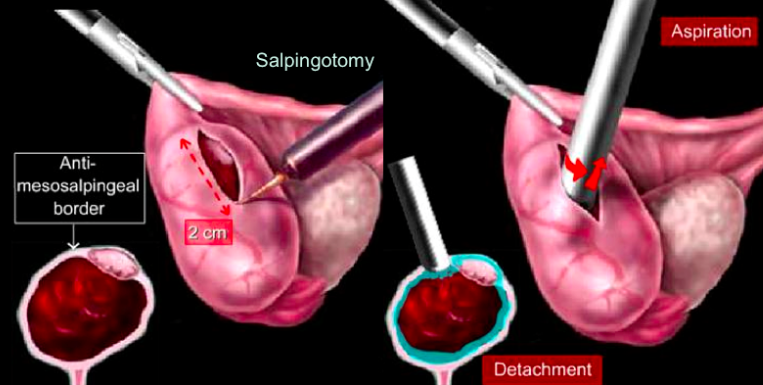 This is usually carried out laparoscopically (keyhole surgery) and involves either removing the ectopic pregnancy tissue from the tube (so the tube is retained – an operation called salpingotomy) or removing the affected Fallopian tube and the ectopic pregnancy completely (a procedure called salpingectomy). 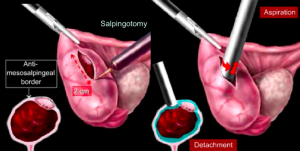 In some circumstances it may not be possible to use keyhole surgery to remove the ectopic pregnancy and a laparotomy will be required (conventional open surgery through a bikini line incision).This usually happens if an ectopic pregnancy has ruptured and the operation has to take place relatively quickly in order to stop the bleeding. 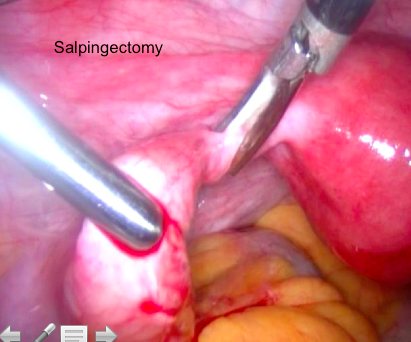 There is also an issue of training as not all surgeons are as familiar with laparoscopic surgery as others. It may be disappointing not to have keyhole surgery – but it is much more important that the surgeon uses the technique he or she is familiar with. The key question is: which management approach is best for any particular ectopic pregnancy? The balance lies between wanting to do as little as possible (so perhaps avoid surgery) and the risk that if an ectopic is managed as an outpatient it may rupture and lead to serious internal bleeding. Certainly the trend is towards more conservative approaches to be taken, and in the past many ectopic pregnancies must have been in effect “over treated” – because of the fear that a patient might collapse at home. So what has changed? The main thing is that most ectopic pregnancies in developed countries are now detected earlier in the disease process and so there is more time to evaluate them and allow clinicians to see if they will just fail on they own or respond to medical treatment before they reach a dangerous stage. This entry was posted in Diagnosis, Diagnosis and treatment, News and tagged early pregnancy, ectopic pregnancy, laparoscopy, methotrexate, salpingectomy, salpingostomy. Bookmark the permalink.